“Yager GT200i?” Who names these things? Didn’t Vespa recently have a GT200? They should have chosen RT or ST… GT is a Vespa call sign. “Yager?” Spellcheck please: “Jäger,” yep, that’s what I thought, the German word for “Hunter.” Not an entirely bad name for a scooter. The downside: as an homage to the Sym-Phony 125, they printed the word Yager on the side but they stylized the Letter “A” as to include the left arm of the “Y,” so now it looks like it’s an “Ager GT200i.” I’m aging fast enough on my own, no help needed thanks. 200cc? Yes, it’s only a 175cc motor. It joins the ranks of the Vespa GTS278ie Super and the SYM HD171.2 scooters who “add a few inches” to impress the size-conscious customer. The biggest attraction to this scooter for me is the fuel injection, which is definitely enough of a plus to let me overlook being a little “expansive” on their model designation. If you think of it as the Kymco Grand Vista’s little brother, you’re on the right track. Price: Well, they pretty much nailed it at $3499. 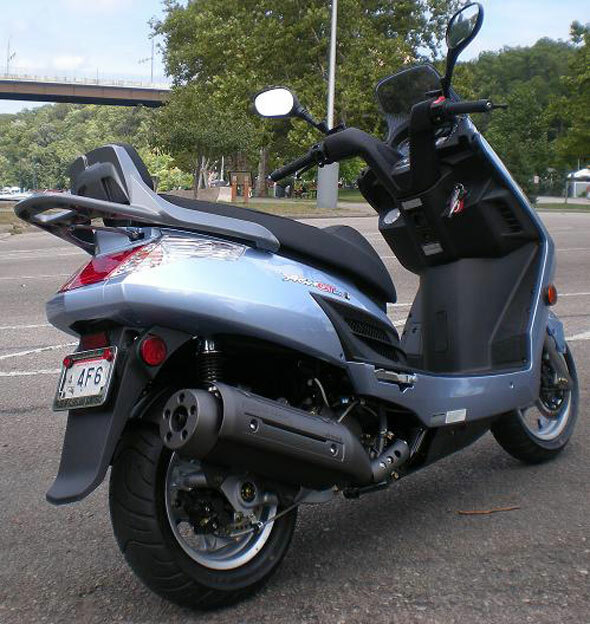 Less expensive than the $3799 SYM HD200, and a grand less than the $4499 Honda SH150. Kymco and Honda both have a reputation for indestructible scooters so Kymco’s 2-year unlimited-mileage warranty is better than Honda’s, but probably not a deal changer. Speed: That’s where this bike shines. Off the line, it’s not dramatic like a Genuine Buddy 150 or a SYM HD200, but it runs away in the smooth and uneventful fashion of most fuel-injected bikes. The top speed is very impressive, the test bike was not remotely broken in yet, and we showed 76 mph. Before you start saying “yeah, that’s what it said on the speedo…how fast is it really going?” Tada! For the first time ever we have a scooter with a 100% accurate speedometer. At 30 mph and 60 mph it’s GPS-dead-on-balls-accurate (it’s an industry term). It’s pretty cool to ride a scooter that tells you how fast it’s actually going. Comfort: Typical Kymco, ergonomic engineering is clearly something they pay attention to. The Yager offers a task chair/keyboard riding position. The seat is covered in the same “Gription” vinyl as found on other Kymco scooters. I love this stuff because it’s not slippery, doesn’t stain and looks sharper than the fake leather or slippery vinyl we see on so many other bikes. If you felt crowded on the Grand Vista 250, you’ll be happy to learn that while the Yager has the same inner-legshield gas cap (key activated – slick) and straight down or extended leg riding position, somehow they’ve managed to find an additional 6″ of knee room that is greatly appreciated by those of us over 6′ tall. Where my right knee is nearly hitting the ignition key on the GTS250 and HD200, and I have bent several keys on Grand Vista scooters, the Yager gives me plenty of room and has an actual flat floor that gives you many different foot positioning options. Passengers will like the “switchblade” button-activated passenger pegs, roomy back seat, and standard-equipment backrest and grabrails. Handling: The 13″ wheel up front smooths the bumps nicely and the 140/70×12 rear tire is wider than most in this class. I did all of my testing with the rear shock preload in the middle position of 5 available. The ride was sporty/stiff, not lounge-chair comfy. This bike does not come equipped with linked brakes. The large discs at the front and rear are more than up to the task of hauling this bike to a stop quickly with no drama. Some folks swear by linked brakes, others can’t stand them. I think in the hands of a novice it’s a great safety feature. As an experienced rider, I often use just the rear brake to help pivot into a turn, so independent brakes are important to me. Fuel Capacity/Mileage: The manual says it holds 2.9 gallons. From dead empty I was able to pump a hair over 3 gallons of 87 octane. which is more than adequate for a 200cc fuel injected scooter. We found that when the fuel light started flashing it was able to take 2.2 gallons which leaves a .8 gallon “reserve” which is better than most. My first tank of gas returned 81 mpg. This tends to increase as the bikes break in. A 240-mile range is very impressive for ANY scooter. Storage: The underseat storage area had no problem taking a Fulmer XL Modular helmet. There was still enough room left over for lunch or a rain suit. The rear rack is big enough to install a Givi top case without the use of an additional bracket. Looks: Well, you either love it or hate it. Thanks, Phil! As far as looks, I think it looks like a cross between an 80s Yamaha Riva and a generic Chinese scooter, but it’s nice to see Kymco back in the game with a new product after several very quiet months. Their naming and branding has always been a weak spot, but the bikes are generally very solid in quality and performance, and usually a great value, sounds like this one maintains that reputation. The 200cc niche, nearly empty in the U.S. a year ago, is getting crowded with a wide variety of styles and prices, and that’s good news for consumers who were bit by the scooter bug last summer and are looking to upgrade from their first bike. The sad part is, Kymco has changed some of their names, and while they’re much better than local names, they’re still weak. The Grand Vista is called “Grand Dink” in Asia. I still think the Kymco Bet&Win was one of the best bikes around, and the name probably held it back more than anything. I say it so much I sound like a shill, but Genuine is the only brand that has any kind of grip on marketing. Genuine’s product isn’t any better than SYM or Kymco, but their marketing sure is. Yep, a couple tasteful decals can save any bike. I still think if TGB had gone all-out retro-manga and played up the name “Taiwan Golden Bee,” their bikes might have sold. Half the charm of that SYM Wolf will be lost if they try to de-engrish it. ROC pride! I hear you Bb. What I have in mind is using a dark paint job for the entire machine or maybe a two-tone paint job with a darker color on that upper light-pod structure to de-emphasize the disjoint appearance of the design. The rest of it might be tolerable if that one aspect of the frontal appearance of the design were toned down (or not, heh…). And, yeah, the name is total craziness, but this situation isn’t that uncommon when a company does business in a culture as alien as US culture must be to the Taiwanese. If they felt that our business was key to their survival as a company, they’d hire a US consultant to resolve that issue. I’m glad to see mor 200cc-ish scooters hitting the US market – this size seems a good compromise for those of us who primarily drive in town but want the higher speeds necessary for some highway riding yet at a more affordable price than the 250s run. FWIW – taking out and thrashing your lil’ Buddy for 30 miles doesn’t sound much better than doing the same with your Dink. Genuine defintely has done a better job marketing their scooters, but ADLY with the Panther, Fox, Thunderbike and Jet have much better names for the US market. In Canada they are calling this scooter the Frost. I don’t know why they didn’t just use that name in the US as well. Anyhow, it is ugly as sin. Great review on a great scoot. Although I’ve never seen so much whining over a name.